Industry Experts, Inc. introduced the new market research report “Synthetic Biology – A Global Market Overview“. The new report reveals that Oligonucleotides leads the global demand for Synthetic Biology products and is projected to reach US$9 billion by 2023 while Chassis Organisms is projected the fastest growing segment in the coming years. In Synthetic Biology, the concepts of molecular biology and systems biology are combined with principles of engineering for designing biological systems and bio-factories with the goal of creating superior biological functions that can address existing and future concerns. Experts are of the opinion that synthetic biology has the capacity of revolutionizing the methods by which energy is created, food is produced, industrial processes are optimized and diseases are detected, prevented and cured. 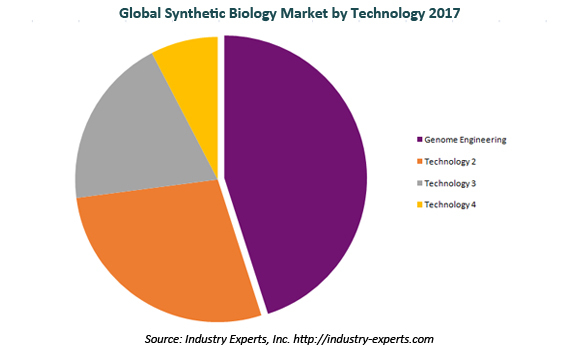 Market for Synthetic Biology product types analyzed in this study include Oligonucleotides, Enzymes, Chassis Organism and others (Cloning Technology Kits, Xeno Nucleic Acids etc). The Synthetic Biology Technologies analyzed in this report comprise Genome Engineering, DNA Sequencing, Biological Components and Integrated Systems and other technologies that constitute Pathway Engineering, Bioinformatics, Microfluidics etc. The report also encompasses the market analysis for Synthetic Biology Applications such as Medical, Industrial, Environmental and other Applications that consists Agriculture, Biomaterials etc. Genome Engineering represents the single largest technology in the global market for Synthetic Biology, demand for which is estimated at US$2.9 billion (45% share) in 2017 and is projected to reach US$9.4 billion by 2023. During period 2017-2023, the market for Biological Components and Integrated Systems is slated to record the fastest CAGR of 24.8%. The report reviews, analyses and projects the synthetic biology market for the period 2014-2023 globally, and the regional markets including North America, Europe, Asia-Pacific and Rest of World in terms of USD. The regional markets further analyzed for 14 independent countries across North America – United States, Canada and Mexico, Europe – The United Kingdom, Germany, France, Italy and Spain; Asia-Pacific – Japan, China, Australia and India: and Rest of World – Brazil and Israel. The report analyzes the synthetic biology market in the above regions by major country, technology, product type and by end-use application. This 394 page market study includes 287 charts (includes a data table and graphical representation for each table), supported with meaningful and easy to understand graphical presentation, of market numbers. The report profiles 19 key global players and 36 major players across North America – 27; Europe – 6; and Asia-Pacific – 3. The research also provides the listing of the companies engaged in the production of synthetic pharma products, semi synthetic enzymes and sweeteners; as well as providers of synthetic biology oriented tools, technology and services. The global list of companies covers the address, contact numbers and the website addresses of 233 companies.